Sigo Signs makes high quality signs that are designed to last for years without any fading. We test our products thoroughly to insure that they meet the highest quality standards. Our customer service team is on constant call to answer every concern a customer has within 24 hours. If any customer has an issue we are always happy to replace a sign and of course our signs are covered with a Money Back Guaranteed Policy. Notice - This area is under 24 hour video surveillance is a sign made of rust free aluminum. Its size is 10 X 14 inches. 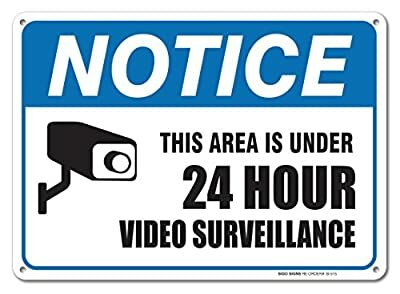 It is weather resistant and will not fade in rough weather.This video surveillance sign is perfect for homes and offices. Our signs are all made in the USA and ship within 24 hours to customers. HIGH QUALITY MATERIALS-We use only first-class materials to manufacture our splendid video surveillance signs. This one is made of 100% rust free strong aluminum and will stay as good as new even after many years of indoor or outdoor use. And it is made in the USA! UV PRINTED-That means that the graphics and wordings will withstand the elements and will not fade. Long-term protection from lawbreakers is now possible! 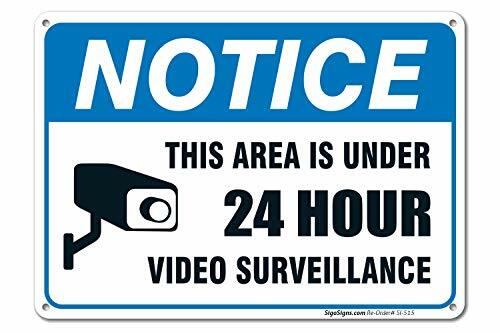 PROFESSIONAL GRAPHICS-The graphics used for this CCTV sign have been carefully designed to satisfy the needs of any customer. You can place it outside your house if you want to inform possible intruders. 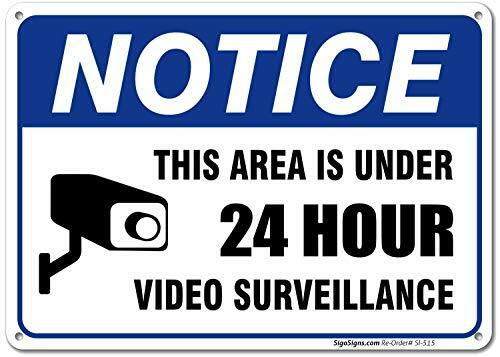 Or you can notify your employees that everything they do is recorded on camera if you are a business owner! APPROPRIATE SIZE-We have carefully designed the 10x14 inch size of this security camera sign considering every aspect. This unique size gives the ability for the wording to stand out and be easily understood without creating an aggressive environment! 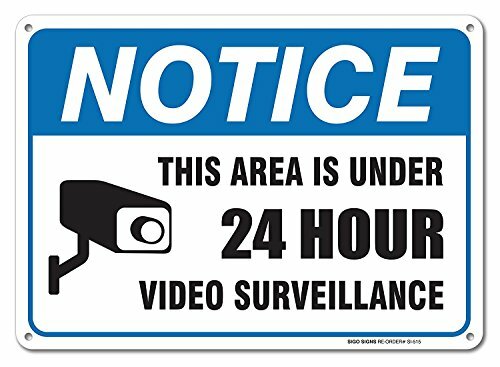 HASSLE FREE MOUNTING-Every video surveillance aluminum sign has 4 pre-drilled 3/16 inch holes and can be easily mounted on every surface. Place it easily with no need of adhesive or special equipment!